Hospitals for the sick came into being shortly after the time of Christ, when the government of Rome established regulations for such facilities, as well as medical licenses for trained physicians. Five hundred years later, Japan's Crown Prince Shotoku is said to have completed a hospital in Nara. In 970, a great hospital was founded in Baghdad by vizier Abud al-Daula with a division between physicians, interns and externs. 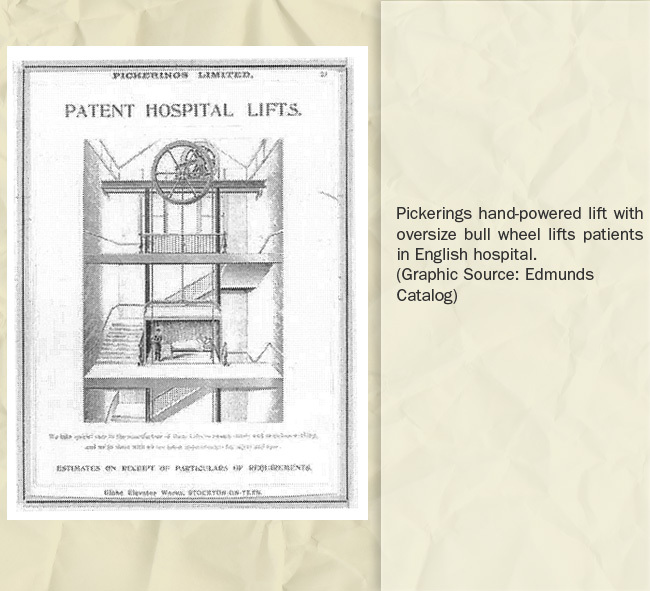 The patients of these facilities required careful handling, and no doubt, various types of hand-powered lifts existed for many centuries in multistoried hospitals. 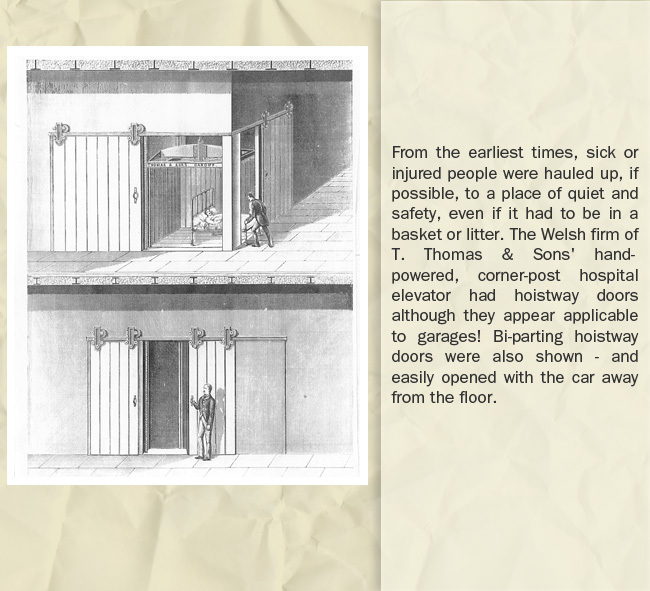 Fortunately, early patients could not observe that they were being raised by a single rope with no safety! The catalogs of by-gone lift manufacturers indicate a number of hand-power devices to be used for lifting infirm and aged persons at home. Royalty, and those who began accumulating great wealth during the Industrial Revolution, lived in multistoried palaces or baronial estates. They desired the amenity of easy movement between floors when unable to handle the staircases. Initially, various kinds of hand-power lifts served to move the infirm of high estate. 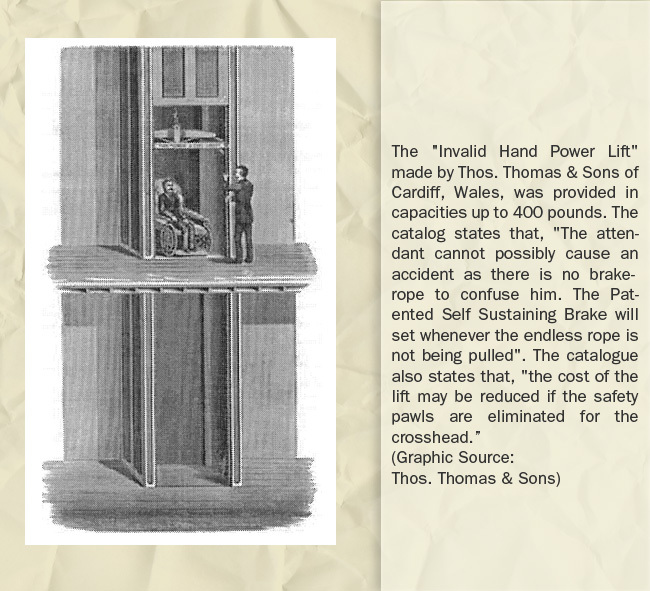 When electricity replaced the bulky stream and hydraulic power, private elevators became more compact and came into their own. The literature of elevator companies indicated that commercial-type lifts were installed in the multistory mansion homes on New York City's Fifty Avenue and equivalent neighborhoods in other major cities. Streamlined design of electric lifts eventually allowed single passenger residential lifts to be "packaged" for easy installation in the two- and three-story homes. Another "arrow in the quiver" of the elevator company was the electric "stair climber" that made it possible for an infirm individual of modest means to remain at home. 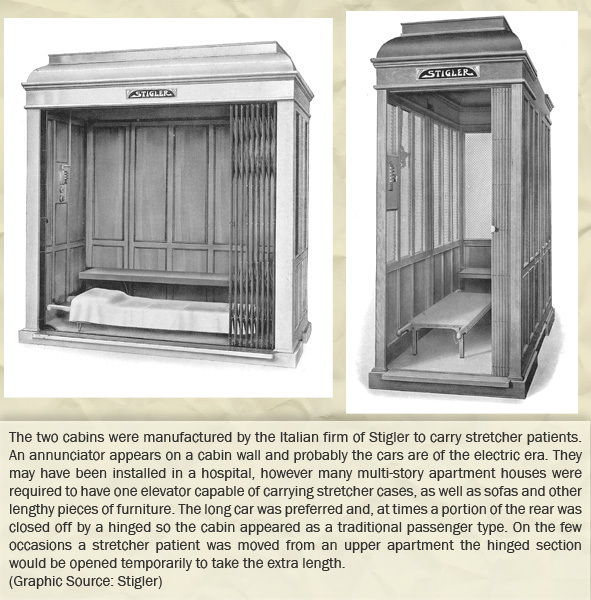 On the other end of the scale were the emerging high-rise hospitals in which a score or more elevators -- sized to carry beds -- were coordinated to serve the complex needs of what had essentially become a minicity!